This past weekend, I’ve had the house to myself, and it’s been very nice! Just me and Lainey. My mom’s off in the Domincan Republic! Lucky bum! And, not only that, shegets home Wednesday night, her birthday! So I’ve already picked out a cake to bake for her! Which will be waiting for her when she gets home. Eating cake at 1 am isn’t bad..is it? I didn’t think so. You’ll have to wait and see what it is! But, in the meantime I decided I needed something to hold me over. 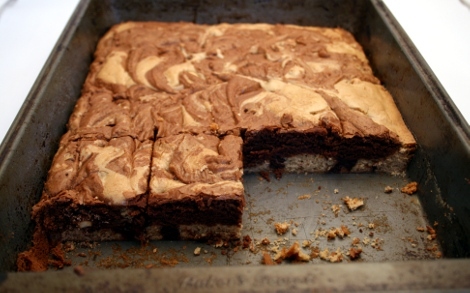 Before making these, I was contemplating whether or not I wanted to make blondiesor brownies. So I decided to make two-in-one brownies! That way, I could enjoy both! I’ve never actually made just blondies, but im sure they would be good on their own. You can keep the recipe as is for blondies, if you’re having a blonde moment. Or, you can split the batter in two and keep one blonde, and one dark! 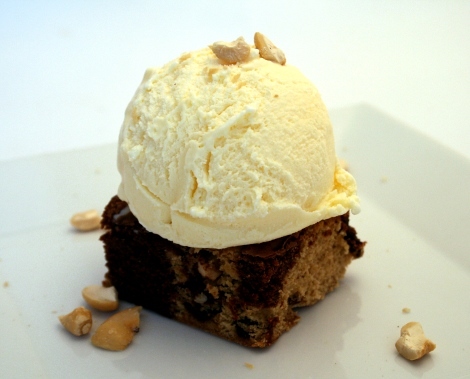 I got the recipe for the blondies from here, and then added my own substitutions and created a chocolate brownie recipe from it as well. I already promised some to my neighbour, for fixing the fence. I hope they make it to him. . . Enjoy! Grease a 13×9 inch baking pan or line the pan with parchment paper. In a large bowl, mix together oil and brown sugar. Then add the eggs one at a time and beat until smooth. Spread batter into prepared baking pan. Batter will be thick! Bake until a toothpick inserted into the center comes out clean, about 25-30 minutes. Remove from oven and let cool. After mixing in dry ingredients, seperate half of the batter into another bowl. Stir into one, the chocolate chips and some of the nuts. Drop, by heaping spoonfuls into the pan the blondie batter, you could use an ice cream scoop or large serving spoon, leaving space in between the batter to add the chocolate batter. Then, add the chocolate batter and using a knife, or spoon marble the two together in the pan. The good thing about these is, you can make them as marbled as you like, or as separate as you like, so you could get an all blondie, or an all brownie one in the mix! Bake until a toothpick inserted into the center comes out clean, about 25-30 minutes. Remove from oven and let cool. Mine were done at about 26 minutes so be sure to check on them! Those look soooo incredibly delicious! I think I might have to try them tomorrow. Wow, I have to go bake these brownies right now!! Love the brownie recipe!! I’ve never made a brownie with vegetable oil before.. is the texture almost the same as butter without the butter flavour? 2 in 1 is always better!! Lindsay: These are super good! And are very easy to make, and are just soft enough! Brownie Power: These are a must try!! Let me know how you like it! 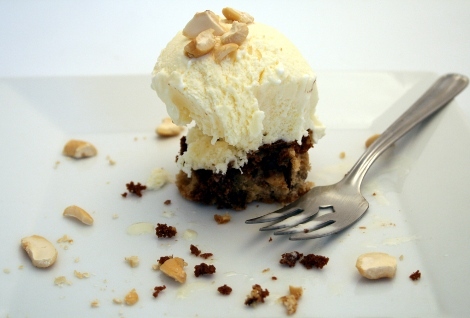 You could also mix in peanut butter to the blondies if you like, or even to the chocolate part! Steph: The vegetable oil is super good! I had never used it before either, but it actually works really well and is a perfect consistency with the brown sugar. It will get very thick once you add the flour, but I used a strong spatula and scooped it out. The flavor is just as good! It doesn’t call for vanilla, and I never did put any in, but you can always add some at the same time as the oil to give it a sweeter flavor. Give it a try! Amy: Yes, the two taste really good together! That is my kind of dessert! Those look so beautiful and incredibly delicious! 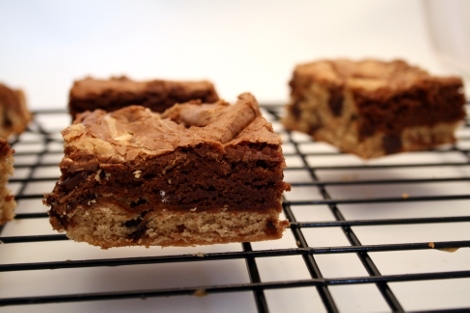 Believe it or not I don’t think I’ve ever seen someone combine brownies and blondies before… It seems like such a natural idea though, these look genius! I bet these would be good with something like cranberries or walnuts or other brownie/blondie fillings… Yum! Sandla: Thanks! I love the marbled look of the two colors! Elissa: I know! I have seen the cheesecake brownie before, that look similar, but of course it has cheesecake instead of regular brownie. Maybe I will start a marbled brownie craze! haha. And you can definitely add whatever you want to them! Oooh! Ebony and Ivory brownies! What a fantastic idea. 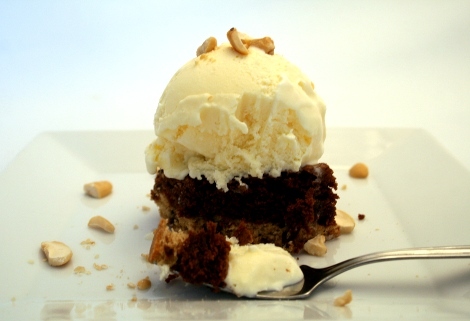 Ingrid: I liked the blondies too, and don’t think i’d ever really had one before! And the combo of both was delicious! Wow those look delicious! I will definitely be trying them. No butter=even better!